I just cannot say enough good things about this beautiful devotional. I really love this devotional because it focuses so deeply on Jesus. 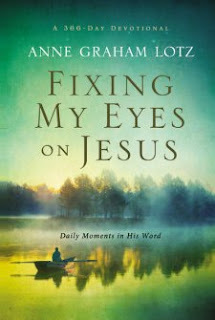 Anne Graham Lotz is one of my all time favorite authors. Her books are never just skin deep but go very deep into Scripture - pulling everything out and making it understandable and applicable to our life. Each devotional starts out with a Scripture which Mrs. Lotz then applies to our life. She helps us to see how the Lord is truly with us in all our life situations. Even though these daily devotionals are short, they are packed with Scriptual promises and truths that will bring you closer to the Lord! This is the devotional I'm using all the time now because it really helps me to keep my quiet time focused on the Lord and to help me to have a greater understanding of His Word. I highly recommend this devotional. It will make your quiet time with the Lord a very personal time with Him! Thanks, that looks good, hope to get it! Blessings.